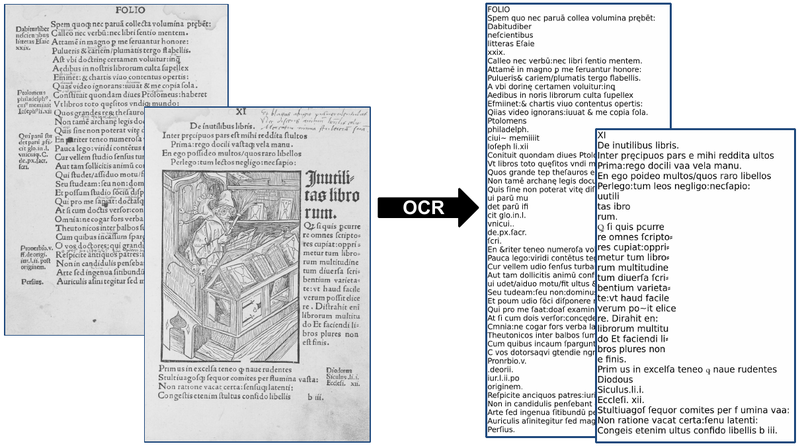 Our OCR module provides an automated preprocessing system for the creation of digital text files. Two working groups, one at the DFKI Kaiserslautern and one at Würzburg University, seek to develop and cultivate new and existing tools and software components that are able to tap into texts that previously weren´t suitable for satisfying OCR solutions. 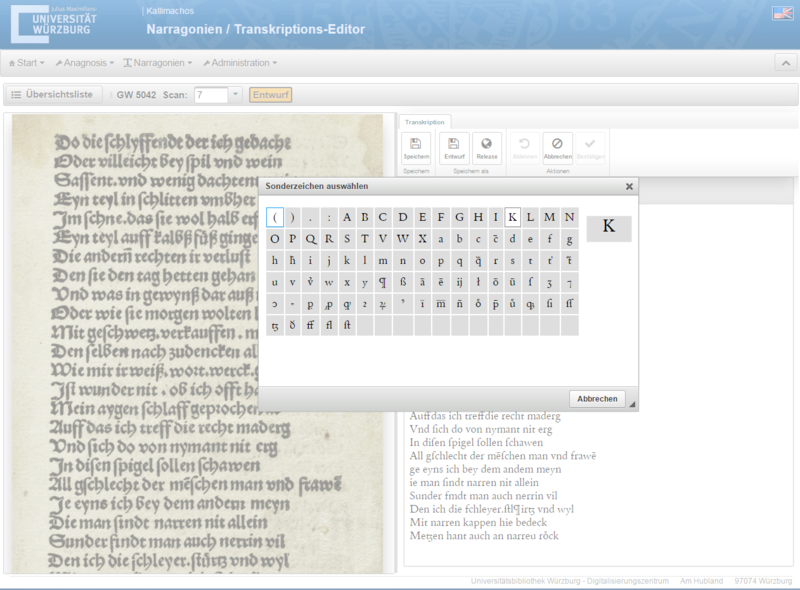 The current focal point of these efforts is our Use Case Narragonien. The DFKI established the term anyOCR for an adaptable optical OCR method, which – in contrast to established OCR systems (i.e. systems based on atomic character segments without more coarse-grained segments like lines or paragraphs) – can adapt to different requirements and the specific problems of OCR for historical documents. Traditional segmentation-free OCR methods based on sequence learning could already be utilized for handwritten, diversly printed and historical documents and were able to recognize complete lines of text at once and with a higher recognition rate than traditional segmentation-based OCR methods. However, to achieve satisfying results with these methods, a lot of manually transcribed training material is needed. The generation of this so called ground truth is time-consuming and expensive. Additionaly, the option of synthetically generating the required ground truth is not feasible in the domain of historical documents, as no representative text are available. To deal with the problem of missing ground truth data for sequence learning, the DFKI has developed the framework OCRoRACT based on the anyOCR-method. 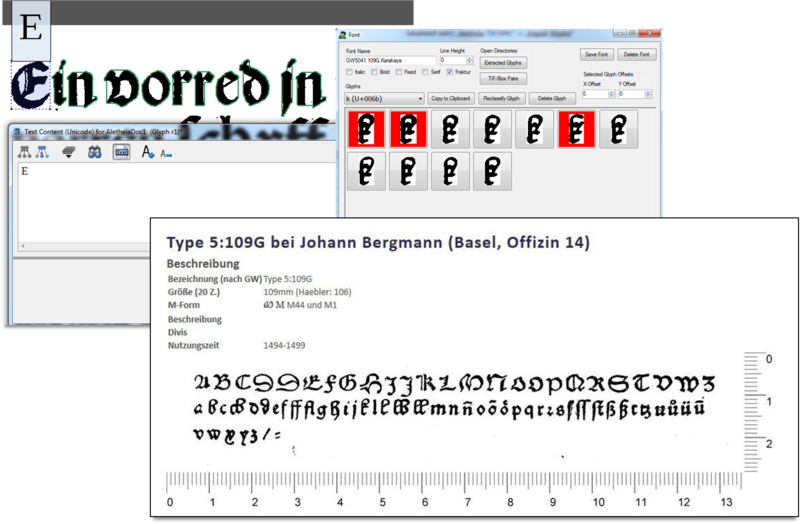 Here, a conventional character-based OCR method is deployed to train an initial OCR model using individually recognized symbols. The resulting lines of text, which (in contrast to an actual ground truth) may be flawed by errors, are then used to train the sequence learning model instead of the manually generated ground truth. By using contextual information, the system is able to learn how to correct the errors in this pseudo-ground truth. An OCRoRACT-System trained in this fashion for historical documents has proven to be able to deliver suitable recognition rates despite the imposed lack of the required dictionaries.